According to some statistics based on monthly active users in recent years, Whatsapp is the most popular mobile messaging app around the whole world. As of early 2017, there have been over 1.2 billion Whatsapp users. Being a free messaging app compatible with nearly all common platforms, such as iOS, Android, Windows, and Mac, Whatsapp mainly allows user to send and receive messages, calls, photos, videos, etc. It is said that a minute voice call only uses 212KB when low data usage mode is turned on. Do You Need A Whatsapp Video Converter? Q - "I downloaded a video from YouTube in MP4 format and transferred it to my Windows 10 Phone using bluetooth. I am able to play this file on my mobile. When I try to send this file to any WhatsApp user, I get error message: Can't send this media. Choose another one. File size is around 5MB yet I am unable to send that file. What could be the reason?" Obviously, Whatsapp supports sharing video online. But there is a great possibility that you would need a Whatsapp video converter, for so many users have run into troubles when sending media files just because of compatibility issues. And the best solution is to convert video to Whatsapp supported file formats. Also, it can be video length or file size or resolution reasons. Whatsapp only allows you to send or share videos within about 90 seconds to 3 minutes. Or rather, the video file size is limited to 16 MB. So another possible solution is to trim the video clips to be shorter, resize video or change resolution, helped by Whatsapp video converter software. 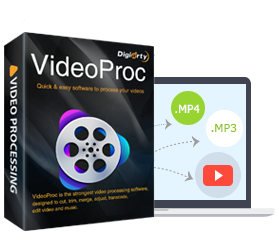 VideoProc is the first-class video converting software in the market. Being as expert in video conversion, it helps freely convert SD, HD and UDH videos in MP4, MP4 (4K), AVI, MKV, HEVC (H.265), FLV, AVCHD, MP3, etc for playing or sharing on Whatsapp, YouTube, iPhone, iPad, Android, Xbox One, and many other devices. While keeping vivid images/hi-fi audio of output files, it also allows you to do multiple video editing: trim clips, crop video, change resolution/aspect ratio, combine videos, etc. How to Convert Video for WhatsApp Sharing? Here we will give you an example of how to convert videos for sharing on Whatsapp step by step, the process of which also works the same on Mac with the Mac version. • Double click the .exe or .dmg file and follow the instruction to get the Whatsapp video converter installed. • Open the software, click into VideoProc - Video and hit "+ Video" to load your source file. • In the Target Format toolbar, click "Video", and then choose MP4 with codec h264 or MP4 with codec HEVC. • Click "Option" to adjust video parameters or just specify Output folder to save the file. • Press button "RUN" to start converting video to MP4 (H.264) for sharing on Whatsapp. As we said before, if Whatsapp doesn't load your video to share or send, it might also be caused by video length or resolution except for video format compatibility. With the same Whatsapp video converter software, you can simply trim/resize video and change resolution. • Resize your MP4 video size to make the file smaller enough for being transferred. • Chaneg video resoluton, such as from 1080x720 to 720x480, to have a try. • Being a video editor, you are also permitted to add subtitles, combine video clips, crop image, change bit rate, frame rate, etc. The strongest one-stop video processing tool to download, edit, convert and resize 4K UHD videos captured by iPhone, GoPro, DJI, etc at fully accelerated speed for sharing on YouTube, Whatsapp, Facebook, etc. How Large a Video Can You Upload in WhatsApp? How Large a Video Can You Upload in WhatsApp? Here, we will mainly discuss WhatsApp video size limit and give tips of how to send large video in WhasApp. All possible solutions to solve Instagram down issues: video not playing on Instagram, Instagram not working, can't log in Instagram, etc. This YouTube video upload tutorial will show you the best YouTube size (resolution and video size limit) that can work well for YouTube. Part 1Do You Need A Whatsapp Video Converter?